Porsche Cayman 2.5 GTS 2dr 2019 Review | What Car? 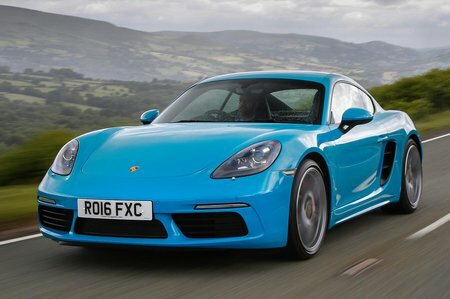 If you were thinking of buying a highly specified Cayman, then the top-of-the-range GTS model makes some sense. You get a bit more power, plus a limited-slip differential, adaptive dampers, a sports exhaust, bigger 20in wheels and the Sports Chrono package. It's pricey, but if you were to add that lot to a Cayman S it'd cost you more, and you still wouldn’t get the upgraded sports seats, extra Alcantara trimming inside or bespoke GTS exterior styling and logos. The GTS uses the same 2.5-litre turbocharged flat-four engine as the S model, but boosted to produce an extra 15bhp. Fitted with the standard six-speed manual gearbox, its 0-62mph time is the same as the S at 4.6sec, although adding the optional seven-speed PDK auto 'box does makes it a tad quicker. You get a sports exhaust as standard, but sadly that doesn't make the GTS sound any less like an original VW Beetle, but it does feel the smoothest and freest-revving of all the Cayman engines.